The Bury Bible is a stunner! 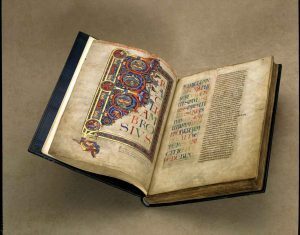 It is thought that it was made about 1135 at the Abbey of Bury St Edmunds in Suffolk in the east of England. 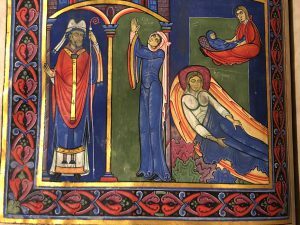 We even know who did the illuminations and who commissioned the bible (quite unusual for a book of this age). 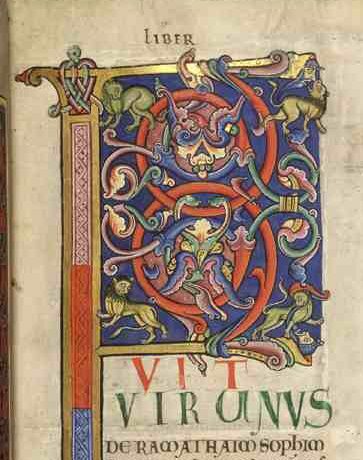 The Gesta Sacrum includes this (in Latin obviously! 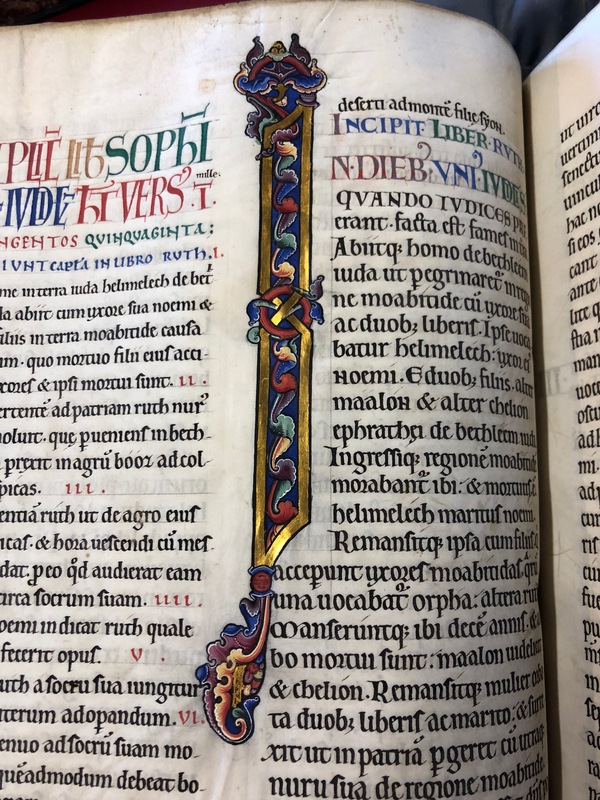 ): ‘This Hervey, brother of Prior Talbot, met all the expenses for his brother the Prior to have a great Bible written, and he had it incomparably illuminated by Master Hugo. Because he could not find calf skins that suited him in our region, he procured parchment in Scotia.’ Although it may seem an obvious translation that the skin came from Scotland, the skins could also have come from Ireland. Master Hugo’s talent was certainly as incomparable as his illuminations. Detailed figures with expressive faces react with one another and look out from wide and heavily detailed framed borders. There is not a lot of gold and the adhesive isn’t very raised, but the vibrant colours make up for any lack of it. 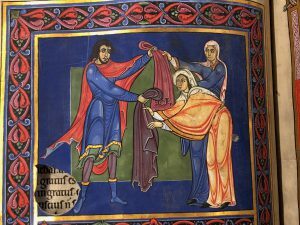 The figures in many of the larger illustrations are set against a dark green rectangle as here; in many manuscript books this would have been gold leaf, but the detailed drapery (wet-linen-look) and active, realistic figures would have competed against shiny raised gold. (Note the interestingly cut hole in this image so that the text from the previous page shows through. 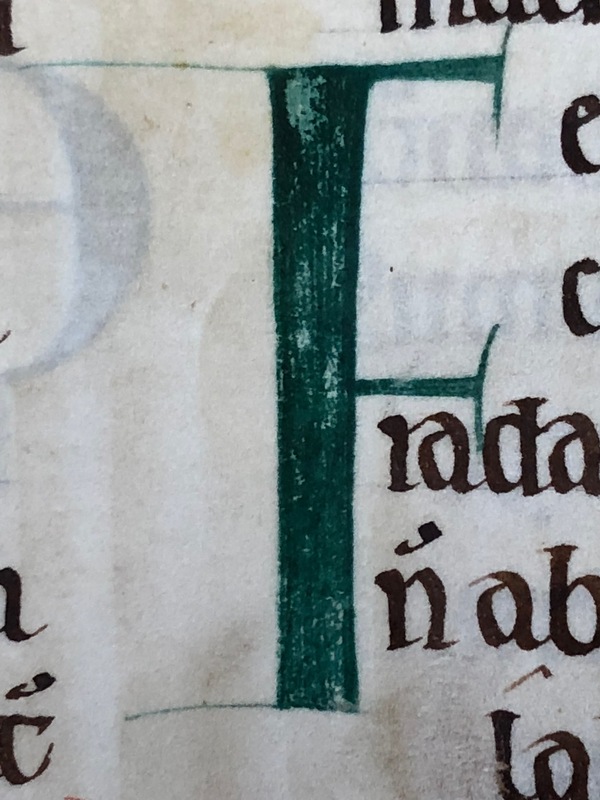 I can’t see any reason why this hole was cut out; it is unlikely that there would have been anything which was later controversial in this picture that then had to be removed, nor is there anything that I could detect on the previous page of text that should be cut out either. Another mystery about the book!). Another mystery is that most of the illuminations are on double pieces of skin. A smaller piece of vellum has been pasted on where the images are to the main page. It’s intriguing why this should have been done. I think there are two possibilities. 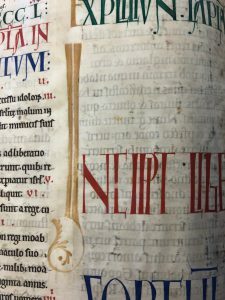 First, there is a lot of paint over the illuminations and it is possible that the water in large areas of paint can relax the structure of the vellum and cause it to cockle and buckle, by having a reinforcing layer underneath this may prevent this. In addition, this density of colour can cause serious show-through to the other side of the skin. By adding an additional layer of skin this will help to prevent this show through. However, it doesn’t look as if the images were produced on separate pieces of skin and these were then pasted in afterwards. 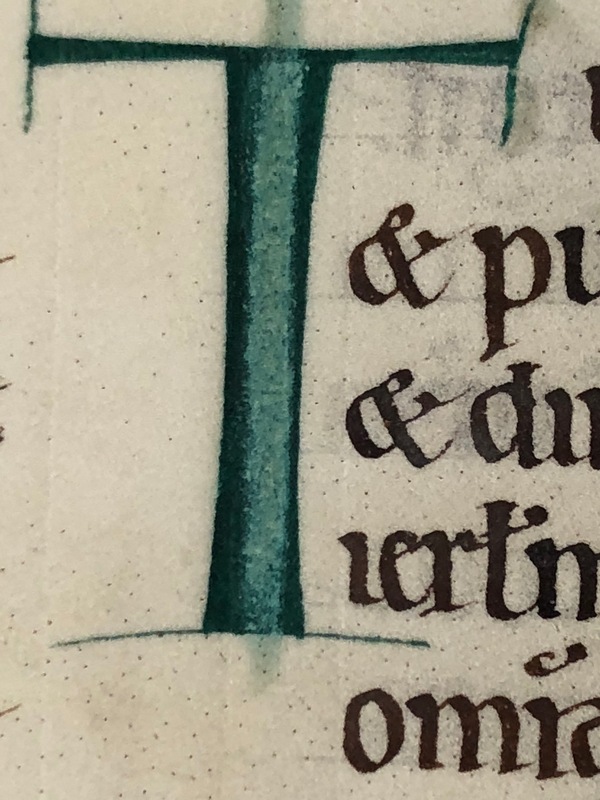 As can be seen here, the piece of skin is longer at the bottom, so some of the second line of green lettering is written over the join (look at the letter ‘S’), and the foot, neck and part of the head and ear of the lion on the top right also are painted over the join. This image gives an indication of the detail of the painting. Even in small areas three or four different tones and shades are used to create a three-dimensional effect, a fine white line gives a highlight and a lift, and the areas and shapes are outlined in black. In this small section, there are two bearded men’s heads also squeezed in, and although tiny, they have been painted so carefully that they still look terrified! 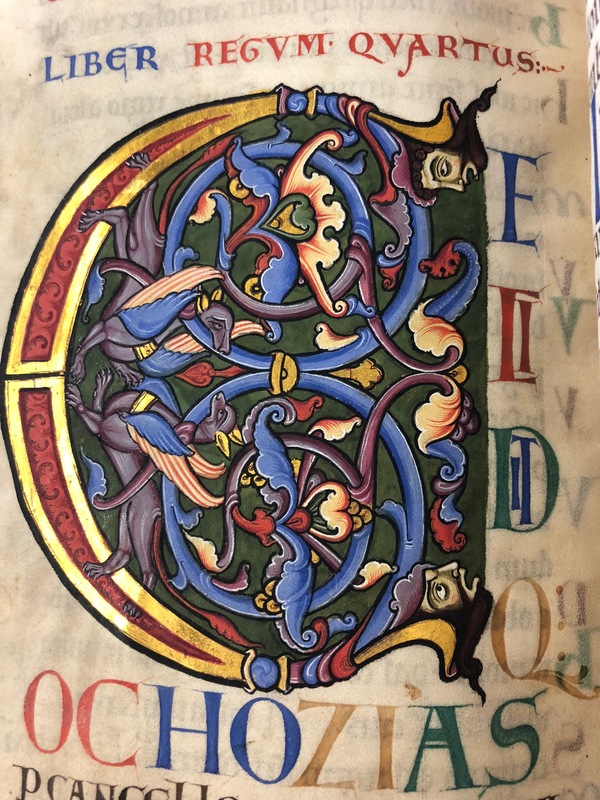 There are very detailed decorated initial letters too such as this one with two blue and orange winged animals munching on a blue swirl, two bearded men, that same green background, and a narrow double ribbon of gold outlining the letter. 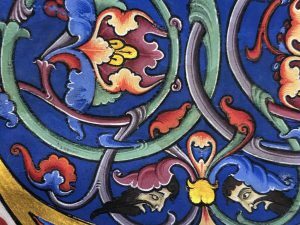 The intense blue is ultramarine pigment made from lapis lazuli from north-west Afghanistan. 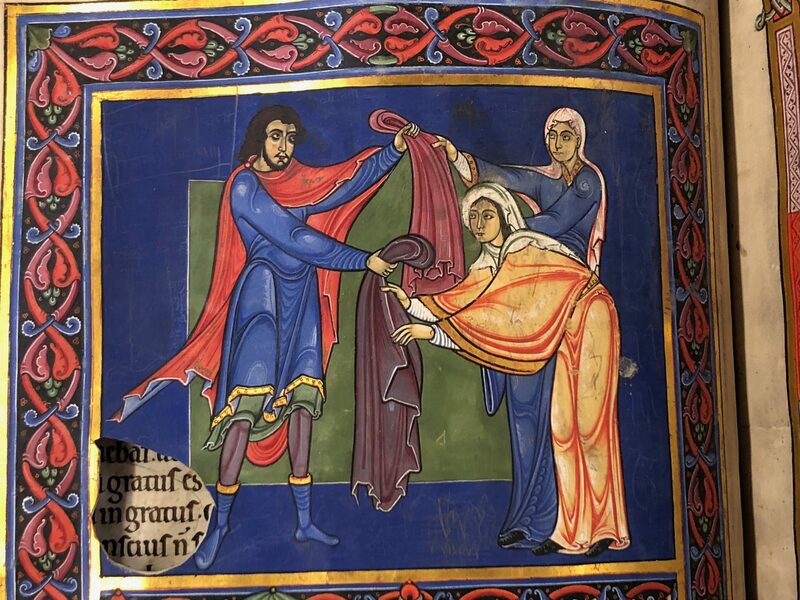 Interestingly, it is thought that this actual pigment came via the Holy Land as a result of raids by the Crusaders, although tests have shown that much of the blue in manuscripts at this time was foliate. 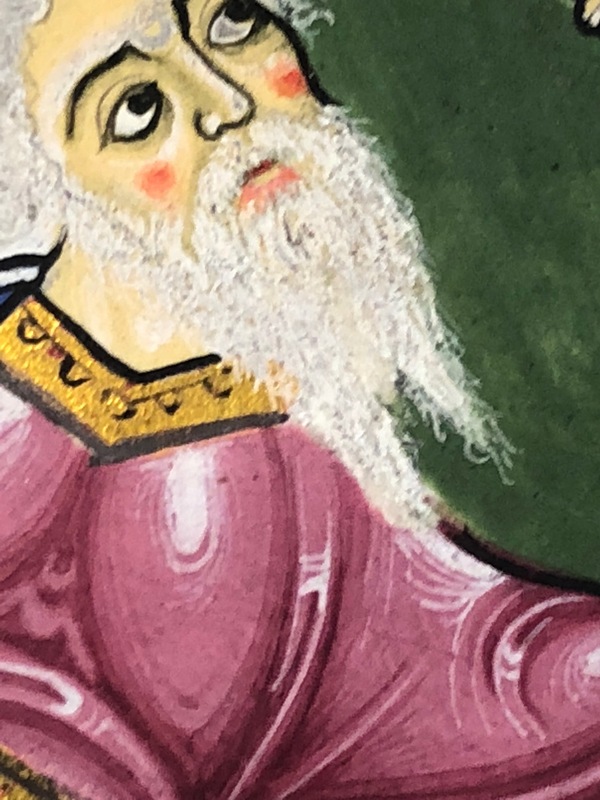 The incredibly detailed painting can be seen easily here with just about every hair in the prophet’s white beard and eyebrows painted separately, and the care with which this face and the modelling on the pink (madder) robe have been minutely picked out is also shown. 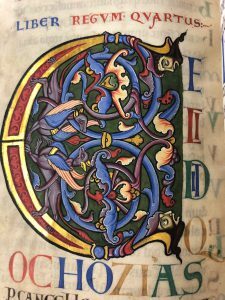 It is thought that the bible took two years to produce; my very rough estimate is that it would have taken this long to do the illuminations alone. There are other enlarged letters too, in red, blue, green and a tan colour. 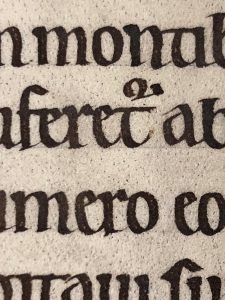 Calligraphically, these are called Versals – letters where the width of the letter is made by repeated strokes. Note here where letters have been placed inside others to save on space. Perhaps the second word on the second line is a little too contracted! That tan colour is most intriguing. 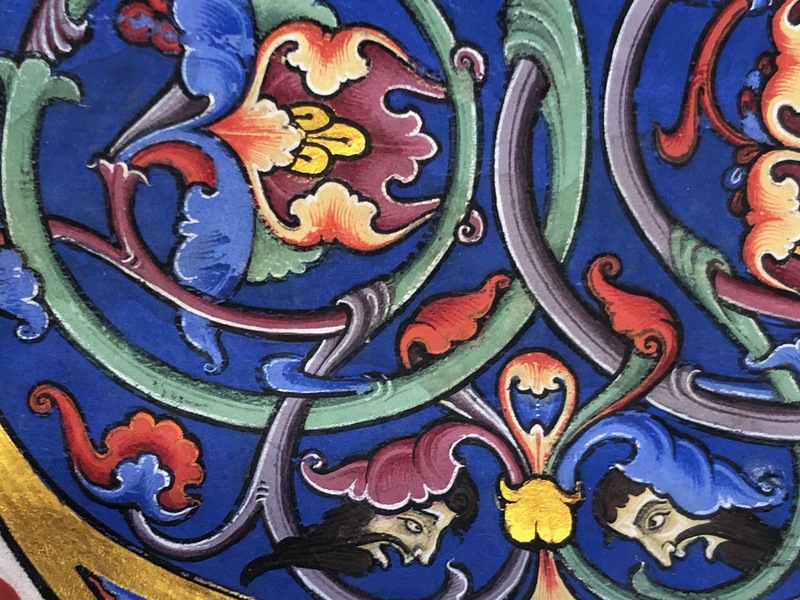 The blue is, as indicated above, lapis lazuli which produces ultramarine pigment. The vibrant red is cinnabar (vermilion), and the green, verdigris (‘Greek green’ produced from copper and quite corrosive).But what of that tan? It is certainly very wishy washy and doesn’t stand up at all against the other jewel colours. And it’s not an adhesive for gold as it’s not sticky. 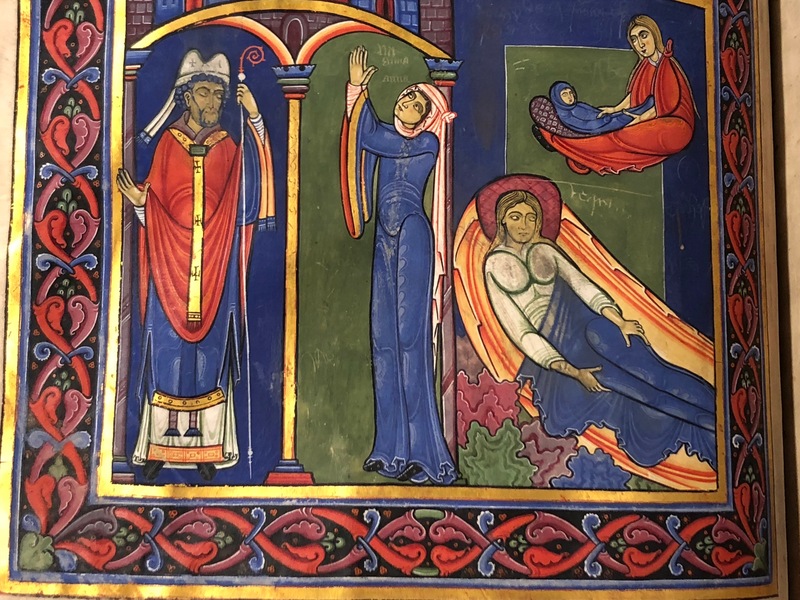 As yet, work has not been done on identifying the pigments used in the bible, but it would be interesting to know what this colour is. 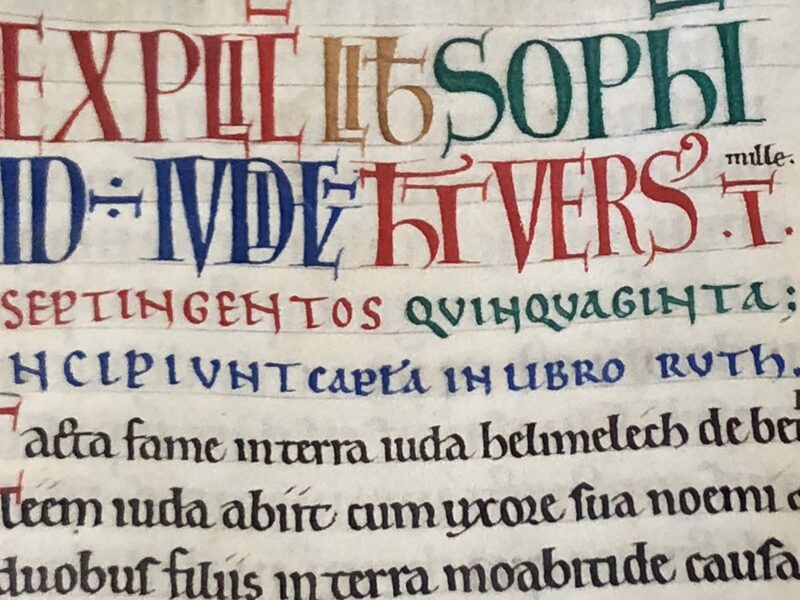 Master Hugo and whoever wrote these wonderful letters were experts in colour and balance, surely it was a much stronger colour originally to hold its own against the rest, and has just deteriorated over the years – but what is it? 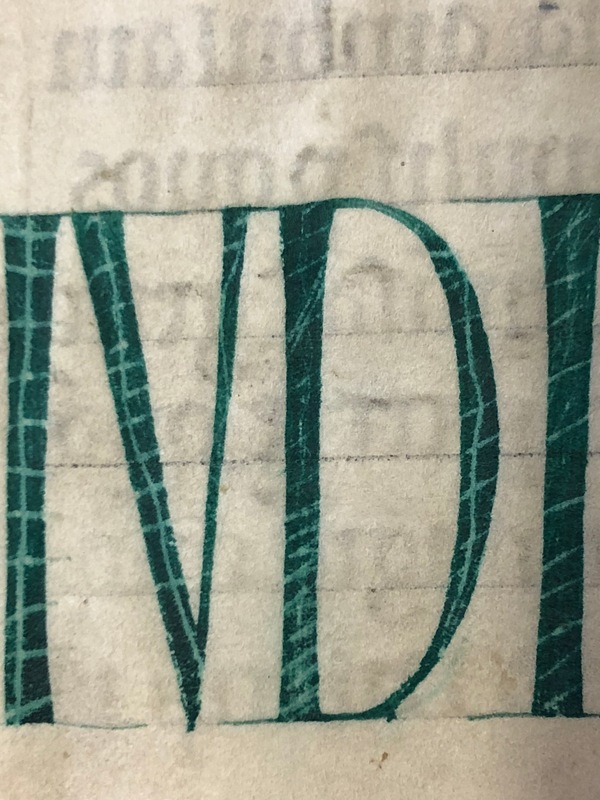 There has been some debate as to whether these letters have been painted or made with a pen. This shows clearly that it is a pen that has made repeated strokes to build up the width as some of the verdigris paint has been worn away revealing the process. 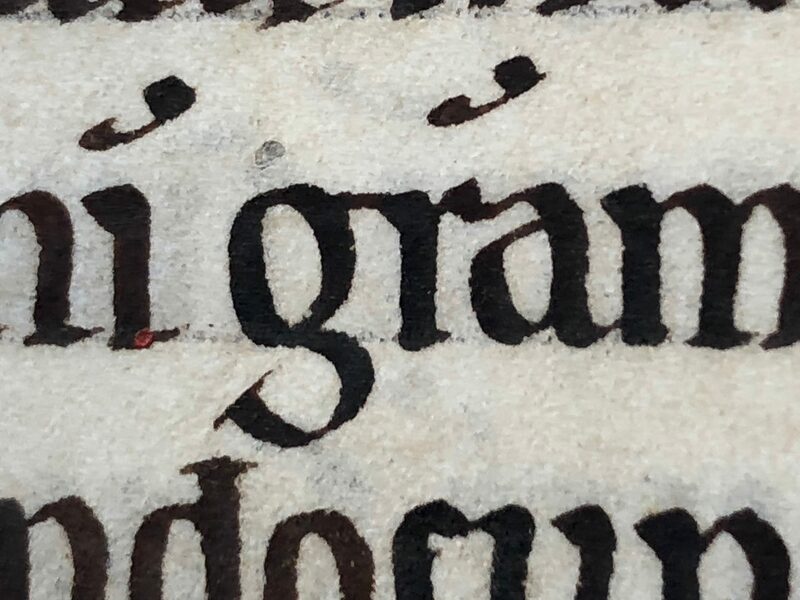 Here the central part of the letter has almost worn away completely. 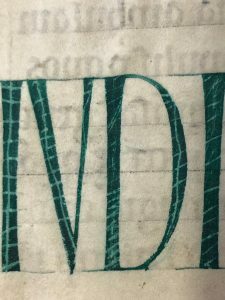 And what inventiveness, as here various patterns have been etched into the strokes of the letters to add interest – or this may have been done by someone not particularly competent later. It is thought that the text was written by one person. It is particularly strong and vibrant – and needed to be with such wonderful illuminations; it had to hold its own. 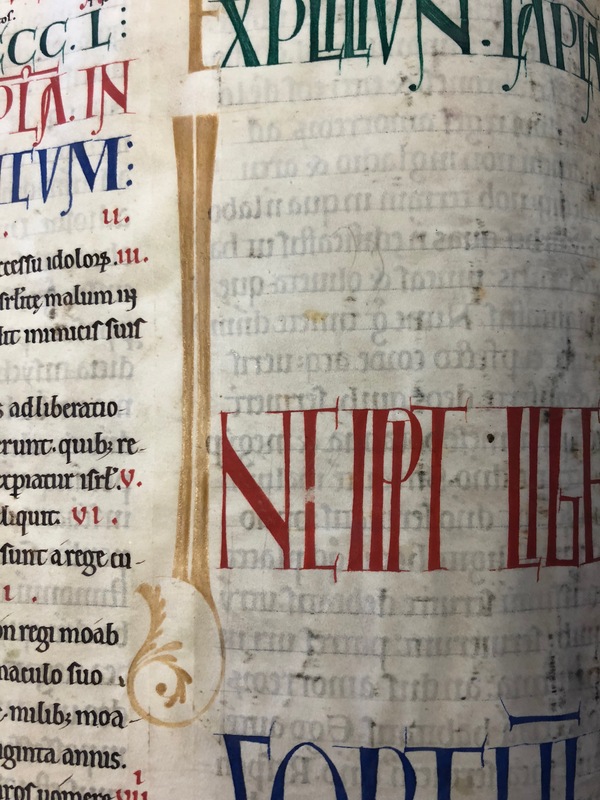 As is typical with manuscripts of this age, there are many abbreviations. 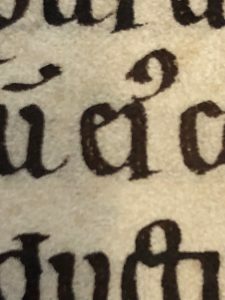 The one here indicates that the letters ‘us’ have been omitted (eius), and is usually written as a curving comma just above the letter ‘i’. Here, the scribe has used the left-hand corner of the pen to draw what looks like a bell-shaped flower. In the absence of a more technical term, we decided to call it a ‘bluebell’ abbreviation! The usual swiftly written abbreviations are taken to another level of careful construction in the Bury Bible. A horizontal bar above letters, again indicating an omission, is written with a thick stroke downwards and slightly to the right (some are almost hooked), and then the second thick stroke is made after a pen lift and with the pen repositioned before making the stroke. 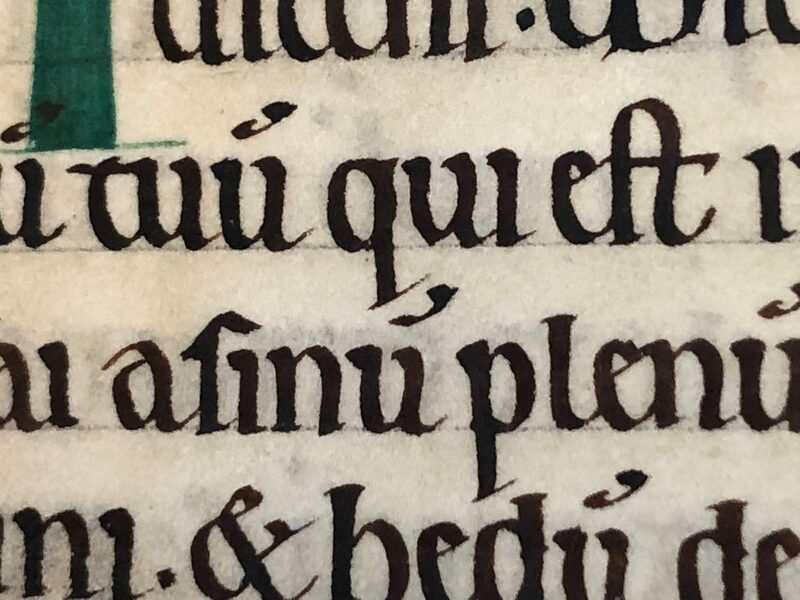 It is clearer here where the repositioning of the last, third, stroke is made after a pen lift as a tiny part of the thin horizontal stroke peeps out beyond the second abbreviation. 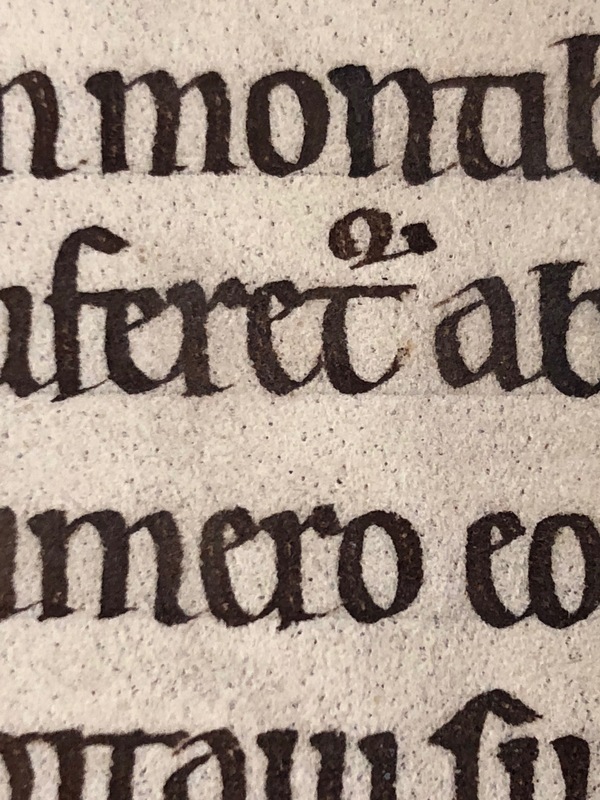 And the abbreviation looking like a little ‘2’ shown here on the second line is written by making first a stroke to the left. The pen is then lifted and the curved stroke moving right is made then downwards to the left, and finally a thin stroke to the right. 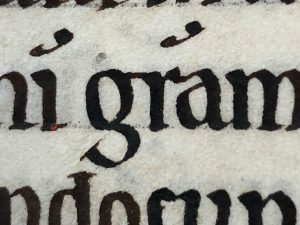 The abbreviation is finished by lifting the pen to make a serif downwards and to the right. This is a tiny curved abbreviation, not even an actual letter, and yet it involves three separate strokes. In this image the surface of the skin can be seen easily, with a wonderful speckling of dark hair follicles. 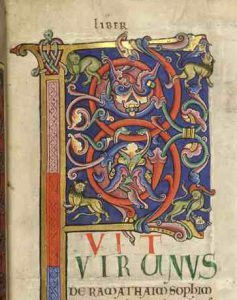 It’s not known whether the incomparable Master Hugo completed the lettering as well as the illuminations. He certainly was a talented man and could well have done so as it is of such a high standard and the care taken on writing matches that of the illustrations. 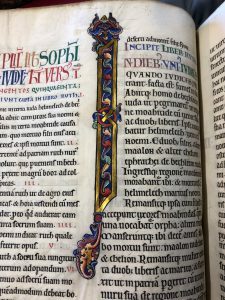 There’s more information about of the book itself here, and images of each page on the Parker Library website here. 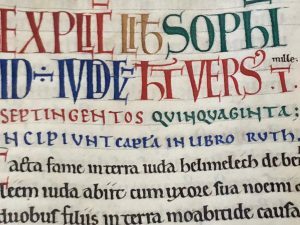 This entry was posted in Blog, Calligraphy and lettering, Manuscripts and tagged Bury Bible, Bury St Edmunds, Corpus Christi College Cambridge, Latin abbreviations, Master Hugo, Parker Library, Suffolk, The Parker Library, twelfth-century manuscripts, vellum, Versals on 14 April 2018 by Patricia.